This interview with Ben Boos is posted as part of a contest we’re running in association with the author and Candlewick Press. Four winners will each receive 1 copy of Ben’s book and 1 WWI goodie bag card, containing redemption codes for a World of Warcraft Tyrael mini-pet and a slot in the ongoing WoW Lich King beta test. See the contest page for full details. Ben Boos was an artist on the Diablo II and Diablo II Expansion. He also worked briefly at Flagship Studios in the early days of Hellgate: London, before leaving to pursue his dream of drawing and writing his own books. 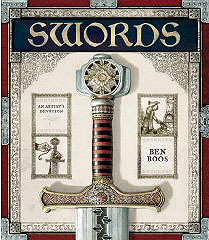 Ben’s first book, Swords: An Artist’s Devotion, is being released on September 9, 2008, and this is no vanity project. Published by Candlewick Press, the initial print run of Swords is 80,000 copies, and the book will be in major bookstores in the US and around the world, including Borders, Barnes and Noble, Target, and CostCo. Want to shop online? The best deal now is a sale price from Amazon.com, but it can also be purchased internationally from Amazon UK, Amazon Germany, Amazon Japan, and Swords is also available through Borders Books, which has retail outlets all over the world, including in Oz and NZ, where Amazon is unavailable. SWORDS: An Artist’s Devotion, is a full-color 96-page hardback book published by Candlewick Press. I made it suitable for children, but I tried to make it interesting for gamers, RPG enthusiasts and sword lovers of all ages. The book is illustrated from front to back with colorful explorations of swords and the characters that once fought with them. I poured my heart into capturing Knights, Kings, War Maidens, Ninja, Samurai, War Chiefs, Sultans, Soldiers and more, across 14 chapters. Calling the book lavishly illustrated doesn’t do it justice. I’ve poured over the copies Ben sent us for this contest, and every page in the book is a visual delight. As you can see from the sample images, even the pages that serve up historical information are eye candy, while the pages of pure art are poster-worthy. 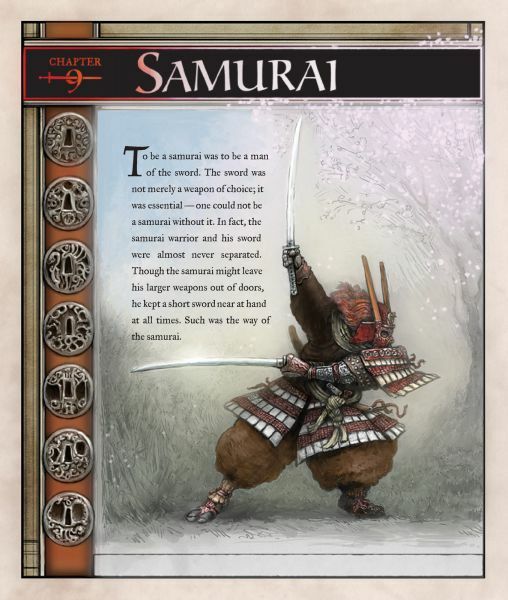 I’ve actually been poking Ben to make some posters available, and of the sample pages we’re presenting, I made sure to request the Samurai art from page 50, since sticking it on my desktop is the next best thing to having it hanging on my wall. We’ve got three sample images, courtesy of Candlewick Press. Each is one full page from the book, digitally reproduced at high quality. I chose images that showed off the different type of material in the book, and the different ways in which it was presented, to provide an accurate vision of what the book actually looks like. Be sure you click through to the full sized images; the book is a large hardcover volume and each page is about the size of a wall calendar. It’s visually stunning. 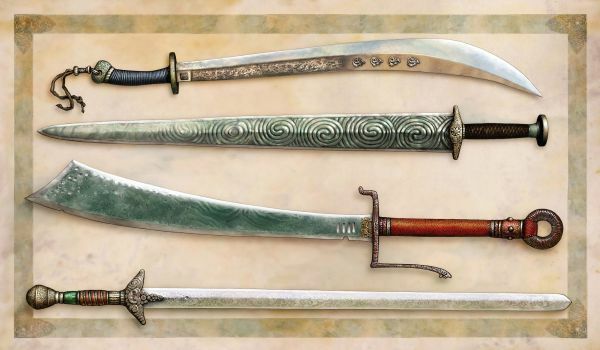 Chinese Weaponry—two page spread showing the level of eye candy Ben achieves in every chapter of the book. The Samurai—Title page from Japanese chapter, showing an image I very much want for a poster. A King’s Sword—Information page about the reverence which which a European King’s holy blade was treated. Here’s a closeup of the pommel of a sword from the Chinese Weaponry page, just to give you some sense of the detail and image quality. This book comes highly recommended; Ben’s an old time Blizzard North fellow and a friend of the site, but I wouldn’t go out of my way to talk up the quality of the book if I wasn’t sincere. It’s well worth the purchase, and his next book looks to be even better, from the sneak previews he’s given me. Click through for our interview with Ben about his book, his time working at Blizzard North, and more. Diii.net: Can you give us a brief biography? Ben Boos: I was born in 1971, in San Jose, California. I grew up obsessed with video games, computer games, movies, and books. My father loved to travel, so I was taken here and there about the world, which filled my head with history, and its crazy imagery and ideas. I knew early on that I wanted to pursue a creative career of making books, games and art, so I mentally steered in that direction. At least that’s what I told my math teachers. Seven years at San Jose State gave me the time to figure out some of my strengths and weaknesses before I switched gears from a state of dreaming to really doing. Diii.net: How did you get your start in the gaming industry? Ben Boos: I created a pitch-packet of sorts; full of artwork, with the hope that it would get me hired. Then I went to the 1997 Game Developers convention in the bay area, bit my lip, and marched up to the Blizzard North booth. As it happens, I completely lucked out. They loved the pitch/resume, and I went to work soon after. Diii.net: When and what did you work on at Blizzard North? Ben Boos: I worked for Blizzard North from 1997 to 2004. When I started, Diablo 2 development was just about to begin, so I leaped in and stayed with that franchise until I left. I did concept art, environment art, user interface art, and even some box art. I created lots of potions, gems, icons, swords and armor, and other goodies. In all, I worked on D2, D2X, and an early version of D3. Diii.net: Why did you leave the gaming industry? Ben Boos: While at Blizzard North, I dreamed up a new crazy dream – to write and illustrate books. I wanted to zoom-in and work in detail, and to spend longer with each painting than game development allowed. I actually pitched the idea to my boss at Blizzard North, but I was needed doing other things. The book dream didn’t go away, and it took on a stronger and stronger pull, until it finally made me leap in pursuit. My head was so full of colorful visions, I just wanted to grab my pen and see what a few years of manic work could produce. Diii.net: Can you imagine working in the gaming industry again? Would you be interested in directing the artistic development of a project? Ben Boos: I love making books and I also love game development. I’m happily working full-time making books, but there may eventually be game related news. I actually took special care to own the video game rights related to the book, I’ll admit. So who knows what time will bring? Diii.net: Where did you find the inspiration to create this book? Were swords a lifelong passion of yours? Ben Boos: The idea to make a book called “SWORDS” actually came after I quit my job. OMG, that felt crazy, let me tell you, and it was one long adrenaline ride. I guess I had an instinct that I would come up with an idea before my parachute fell off. In any case, I gathered my savings, took the leap, and started to scribble. There is nothing like leaping in to the unknown, to force the switch of gears from dreaming to doing. Michio Okamura (the original designer of the Diablo Character for D1) gave me a beautiful sword when I left Blizzard, and it had a big impact on me. My thoughts kept lingering on that, and I think it was a catalyst. I already loved to draw and paint swords, so it occurred to me that I could make Swords the recurring theme of a book. I’ve collected swords since boyhood and gathered knowledge about them over the years, so it just fell into place. I had been creating them for Blizzard North for years, so I thought, “I can do this!! !” I made my pitch-packet about “SWORDS the book”; and sent it to a literary agent. She loved the idea, and got me on the phone with Candlewick. They championed the idea and funded the project! Pitch-packets for the win! Diii.net: Are the weapons in your book ones you drew from real life, or are they products of your imagination? Ben Boos: I did research along the way, but mostly; I just sketched and painted my heart out while writing down notes from memory. There are quite a few accurate depictions of swords, yet there are also some more imaginative paintings, too. I tried to create an armory of exotic, lost treasures; full of weapons never seen before. To do this, I used the surviving historical remnants as a guide, while I extrapolated artistically to create the weapons you see in the book. Diii.net: The book covers swords from a wide variety of cultures. Any personal favorites? Ben Boos: Oh that’s tough. I really love Samurai weapons, but I also love good old medieval swords too! Ack, but I love exotic stuff to! Diii.net: Who would win the battle royale, if you had an expert from each era/culture covered in the book? Ben Boos: This is exactly the kind of question I hope people will have fun wrestling with when looking at the book! I think the huge mercenaries called Landsknechts, with their massive two-handed swords, might make pretty unpleasant company if they were angry. These guys trudged from war to war for fun and profit. Diii.net: Can you tell us something about the nuts and bolts of your drawing process? Ben Boos: I pretty much stick to using a Wacom tablet and Adobe Photoshop. I start with a blank page, put on some background music, and then I scribble away. If I like a rough sketch, then I continue scribbling and developing that area of the page. I work right on top of the rough work, until the picture slowly comes into focus. In rare bursts of inspiration, I can finish huge chunks of a page in a single sitting. Diii.net: So it’s all digital? Do you ever pages to hold in your hands before the publisher sends you proofs? Ben Boos: I started with a mocked-up “book,” made of post-it notes, and laid out the first ideas. Then I bought bigger and bigger printers, so I could print out my work throughout the project. My wife would cut and bind the prints into increasingly more book-like things as we went along. I also sent my work into Candlewick Press as I worked, and they made me several rough test books, which was fun. Diii.net: Did you do everything on the book yourself? All the writing, drawing, page layout, etc? Ben Boos: Candlewick really gave me a free hand to write, illustrate, and design the book. They helped me learn the ropes technically, so that I understood the parameters involved, and they helped me if I had questions or problems along the way. They were a source of great advice and knowledge, but they allowed me to pursue my vision and do my thing. Diii.net: So what’s next? Armor? Ben Boos: I’m already deeply into work on a 96 page sequel! I can’t say what it is yet, but I’ll give some hints: It’s a book full of many strange sights! Monsters and heroes; weapons and armor await the reader!!! Diii.net: Thanks for your time, Ben. Ben Boos: Thank you too! I love Diii.net, so it’s an honor to chat and to give away some books! SWORDS is something that grew right out of the work I was doing for the Diablo games, so I hope it will be enjoyed by the fans of those games. Available soon at all major bookstores (Barnes & Noble, Borders, Amazon.com) as well as stores like Costco and Target. Selected as a featured item for the Scholastic Book Fairs.